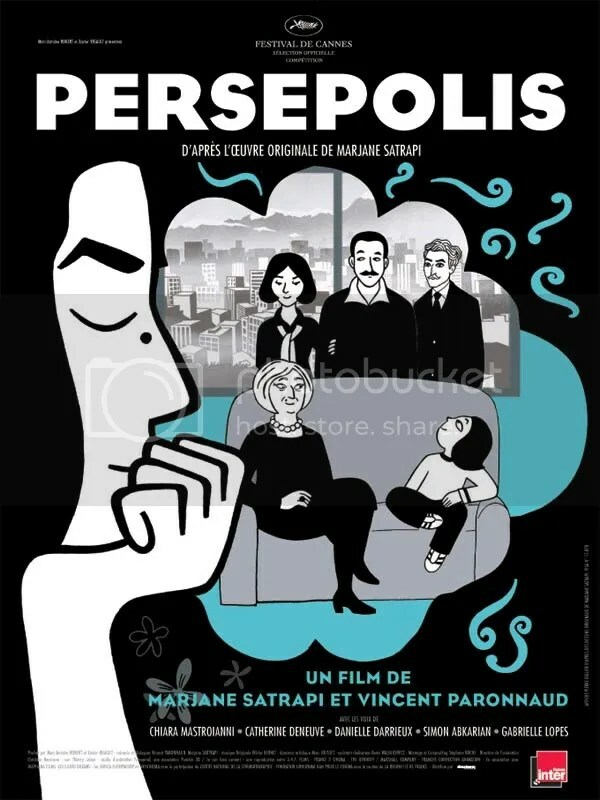 Persepolis is an autobiographical film (the second one reviewed on this site, after A Guide to Recognizing Your Saints) about Marji Satrapi, a girl who grew up in Iran during the Islamic Revolution. In French. For whatever reason, going into seeing the movie, I could not straighten “Iran”, “Islam”, and “Afghan” into the proper order. No idea what I was doing. The film is based off four graphic novels of the same name by Satrapi, and, for obvious reasons, contains a great deal more detail and information on Satrapi’s experiences. Presumably, the illustrations in the book provide the format for the animation of the movie, which is mostly monochromatic, minimalistic visualizations with occasional flares of color that, upon a single viewing, appeared more random than directed. It’s possible that a reading of the book would have cleared away this, and some of my other problems with the film, but as the things stand, the movie has a few disgruntled vagaries for people such as myself to deal with. As a very young child, Marji sees herself as a future prophet, talking to God, and finds herself enthusiastic about any topic her life intersects with. She is a budding revolutionary, fiery and temperamental. When the Islamic fundamentalists imprison thousands and force women to take the veil, Marji is bold and fearless in her challenges, walking a fine line between inquisitive child and prison-worthy revolutionary, a role held by her uncle, the communist. Eventually, the oppressive rule of the fundamentalists takes its toll upon Marji, as she suffers the loss of friends and family members, and her once-defiant emotional directness sinks, becoming candid depression and cynicism. The movie takes place over the course of roughly 10 years, each scene serving as a glimpse into Marjane’s world as it deteriorates and twists. While the portrait is vast, and in some ways, beautiful, Marji’s world on a personal level is left shallow by the technique. Marji’s mother and father are loving, but there is little else to say about them. We can see that much of Marji’s personality is derived from her sparkplug grandmother. We can see little else. Every character is a caricature, focused and distorted through Marji’s childhood memories. While the book may have provided enough depth for Marji’s uneasy clique of Vienna outcasts to come and engage the audience, the cinematic flyover in Persepolis left me wanting. Persepolis’ is, in some ways, a fabulous film. To its own demerit, however, it grabs the audience, and lets it go, only to grab and release again, and again, and again. I would have preferred a smaller snapshot of Satrapi’s life, something that could grab hold and take me somewhere. Nobel Prize winner Muhammed Yunus spoke at the Free Library of Philadelphia yesterday, and signed copies of his book, “Creating a World Without Poverty”. Hopefully, a bit later, we’ll have a little report on his speech, his message, and, perhaps, some commentary on the larger issues. Maybe later today. Maybe tomorrow. So, it’s been well over a month (some would argue close to two months) since we’ve posted on the regular. Since the last post on this site, the machine to select the next US President has begun its official machinations; There Will Be Blood came out and was bizarre and brilliant; Juno came out and was okay, but beloved; Mrs Thursday went on a household rampage; Michael Nutter was made Mayor of Philly, rapped a bit, and got everybody all sorts of excited; the Patriots went to 18-0; the Flyers played terribly, then grandly; and onward and onward. The past month or so has been trying for the blog (apparently, when a blog stops posting, readers stop, ya know, reading), and for the proprietors thereof (lack of internet, motivation). But, we’re back. I’m back. There is backness. In the past, Mr Thursday has been the staging ground for topics the world over. From the renaming of Indian cities, to the glory of Phillie division winning games, to documentation that, yes, someone in Congress has a legal objection to gravity. By and large, though, posts tended to deal with two things: baseball, and beer. As a result, those two topics will now appear on their own blogs, ThursdayBall and MrThursday’s Beer Project. There is a bit of content on the Beer Project, though the site is on the ugly side for the moment. ThursdayBall has nothin’, but it looks okay. Both will start to be updated on the regular, soon. ThursdayBall ball will deal with all things baseball, with an emphasis on the Phillies. The Beer Project will deal with all things beer, but with an emphasis on the Philadelphia area, including an ambitious, as-yet-unstarted series of events. The politics, the science, the movie and book reviews: they’re all staying here. So, add the other sites to your Feed Readers (if beer and baseball interest you), and stick around a while.